Grupo Ruas e Pracas (Group of Streets and Squares) is an NGO based in the city of Recife in the NE of Brazil. 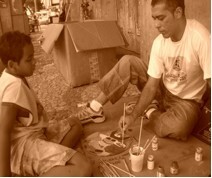 GRP works with street children and other youngsters who live in some of the biggest and most violent favelas in the city. • Street Education involves educators going to various points in the city and using fun and creative games, activities, theatre, dance, percussion and football to inspire and encourage street children and teenagers to consider leaving the street. • CEVN/ Sitio is a positive rural space where homeless children can go for short stays to experiment what life in a safe environment may be like without drugs. For those that stay for longer are enrolled at the local school, health clinic and take part in working on the farm and other recreational activities. • Family social work is an outreach programme where social workers make home visits, offer basic assistance and organise monthly meetings for the relatives of the children and teenagers it works with. • Policy work is a very important part of GRPs work, as well as sitting on policy forums, networks and groups at the local level it works intensively with street children and their families to encourage them as activists, ensuring their rights are respected as citizens and human-beings. GRP runs an active volunteer programme with (inter)national volunteers and interns accompanying all areas of work. GRP has a strong methodology that harnesses the creative and artistic skills of young people and employs an empowering approach that respects the voice and autonomy of the young person to act as a stimulus to seek a better life, build up self-esteem, return or stay with the family, and discourage involvement with drugs, violence and crime through reinforcing positive messages and trusting relationships. GRP is looking for help to increase the capacity of the organisation’s communication tools, in particular events, to effectively spread messages about issues related to street kids and the work that the organisation is involved with. At the moment they hold many events (which take time and resources) but in the end currently have very little impact.